WEST LONG BRANCH, N.J. (March 6, 2017) — A book co-authored by Monmouth University Dean Kenneth Womack has received a prestigious national accolade. “The Eighth Wonder of the World: The Life of Houston’s Iconic Astrodome,” which Womack wrote with Robert C. Trumpbour, is the recipient of the Dr. Harold and Dorothy Seymour Medal from the Society of American Baseball Research (SABR). The book has previously received Shelf Unbound’s Pete Delohery Award for Best Sports-Related Book. 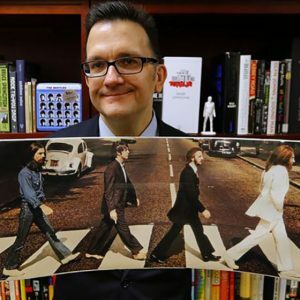 While Trumpbour is known as a stadium scholar, Womack, who is dean of the Wayne D. McMurray School of Humanities and Social Sciences at Monmouth and an internationally known Beatles expert, is not. He is, however, a native Houstonian with a special attachment to the Astrodome. His grandfather, Kenneth Zimmerman, was the building’s structural engineer. Zimmerman developed the “knuckle column” and the “star column,” two features, said Womack, which are still holding the building up today. The Astrodome, which ushered in a new era of stadium construction, opened to great acclaim in 1965. 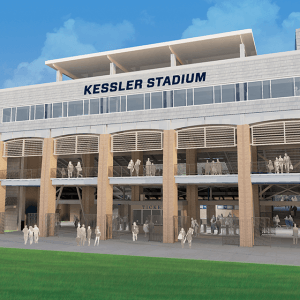 It was the home of Major League Baseball’s Houston Astros from 1965 until 1999 and of the National Football League’s Houston Oilers from 1968 until 1996. The first major sports venue to use an artificial playing surface — Astroturf — the Astrodome closed in 2008. It was placed on the National Register of Historic Places in 2014 and earlier this year it was designated as a State Antiquities Landmark by the Texas Historical Commission. The Seymour Medal was presented at a ceremony on March 4.